As we reflect on this past year, we have so much to be proud of and thankful for. From our people to our professional accomplishments and our charitable endeavors, 2018 was a year to remember! 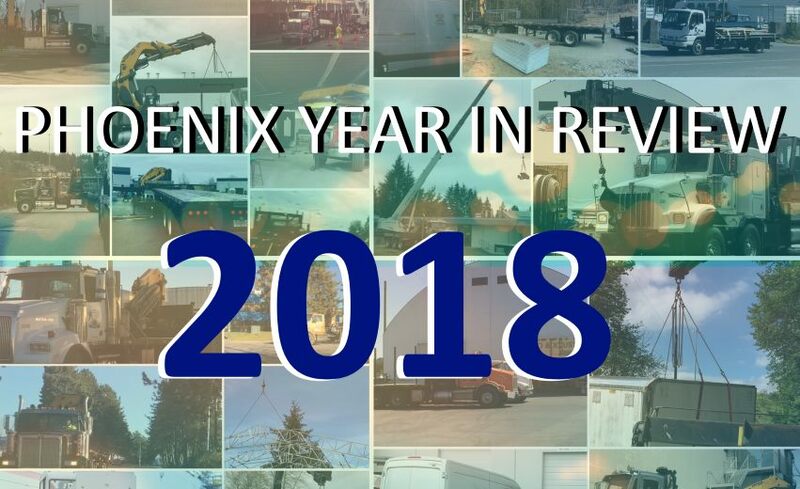 In 2018, we brought on eight new “in-house” members to the Phoenix team and fifty-eight new drivers (most commonly named “owner operators” in our world). They have all added so much enthusiasm and skill, and we’re excited to see them grow within the company. This past year also saw us celebrate some milestone anniversaries – adding to the impressive list of long-time employees who worked so hard to grow this company to where it is now. Today, we have twelve employees who have worked at Phoenix for over twenty years! So, to the new staff, the senior staff and everyone in between, thank you for another great year. This year Phoenix continued to build on its high safety standards with continual compliance of the Certificate of Recognition (COR) and completing a second internal audit. Safety is at the core of what we do and one of the best recognition received this year was to be the chosen company for WorkSafeBC’s newest instructional videos. Shooting took place in our yard and with our own equipment to develop a key occupational & safety resources for the trucking industry. We continue to grow, adding new customers and employees, and recognize all the hard work that it takes to get to the size we are today. 2018 was a very busy year and rewarded us in working with a wide range of customers in both the general freight and crane divisions. We appreciate the continued support and trust of our customers, and look forward to the new ones to come in 2019. We have been so fortunate to support a variety of organizations this past year – those who are doing amazing work in our communities. Our team donated their time, Phoenix donated its services and we contributed to those who are really making a difference in our communities. We are proud to have aligned ourselves with Crossroads Hike for Hospice, Eagle Ridge Hospital Foundation, 25th Annual Cystic Fibrosis Golf Tournament, Ruben’s Ruckus, I am Someone, BC Children’s Hospital, Share Family & Community Services, PoCo Grand Prix, Basics for Babies, Royal Columbian Hospital’s Pediatric Music Therapy Program, You Wear It Well…Just for Grads and more (Click HERE for more details). We appreciate the work that these – and other organizations do – and are honored to have helped in our own way! Thank you to everyone that has supported Phoenix this year – our customers, friends and families – and we wish you all a Happy New Year and cheers to an incredible 2019!